A leopard injured around 12 people in Khowang area of Assam’s Dibrugarh. The big cat also took away chunks of meat from its human prey on Saturday that left everyone in the area traumatised. Locals of the region retaliated back and managed to kill the leopard. Hundreds of villagers armed with bamboo sticks and sharp weapons chased, cornered and lynched the leopard allegedly in the presence of police and forest personnel. Later, in a planned attack, a mob ventured into the jungle and mobbed the leopard, bludgeoning it to death. A few villagers got injured when the leopard attacked in self-defense. Even as police officials under Khowang police station tried to control the mob, they were overpowered. Villagers alleged that forest department officials arrived late at the spot. After killing it, the body of the leopard was dragged by villagers to an undisclosed location. The incident took place just two days after wildlife experts and enthusiasts celebrated the successful rescue of a male leopard in Bokakhat town of Assam’s Golaghat district. This is the fourth incident of leopard lynching in Assam inside the first three months of this year. 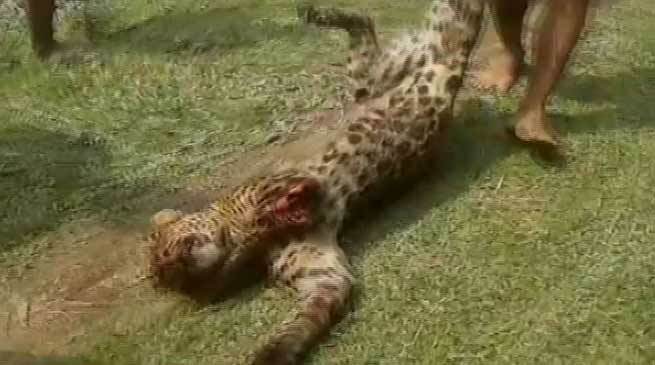 In February, two leopards were killed at Barpeta. Another leopard was beaten to death by villagers in Jorhat district on 18 February.